Home | Acity Life | De Dietrich.. Twist. Click. Cook. 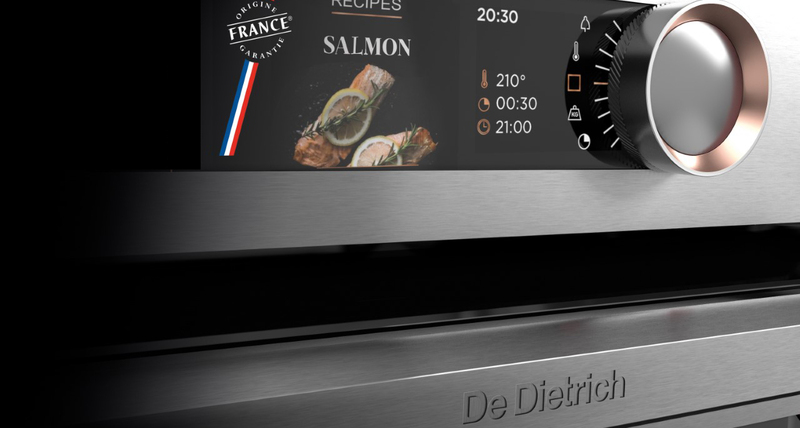 French brand De Dietrich have introduced a cooking concept to inspire culinary excellence in your own home. Giving you the freedom to chef it up on a daily, weekly or monthly basis, whatever your preference. So how does it work? Well, you simply use the dial to put the oven into ‘chef mode’, this enables you to select your recipe and within seconds your dish is ready to cook. Yes, it is that simple! When the oven is in ‘Chef Mode’, it has the precision and control of a real chef live in the kitchen, plus it features exclusive and patented technology that adjusts all settings automatically. This includes the cooking function, the ideal temperature, plus the time your food takes to cook. Giving anyone the ability to perfect every dish like a true professional. I mean we all have our inner chef in there somewhere, right? Even if it is your famous ‘toast a la beans’. Twist – to select your chosen recipe, you simply twist the dial on the oven and choose the recipe you want to cook with from the ‘Chef’, ‘Recipe’, ‘Culinary’ or ‘Pastry’ modes. Whichever floats your gravy boat (awful pun, I know. But I tried!). Click – once you have selected your chosen recipe, click to begin the cooking process. There’s no need to preheat the oven beforehand or guess how long your food will take to cook; the oven will calculate everything all by itself, as long as it is in ‘Chef Mode’. Clever little oven! Cook – this is the best part! Let your oven do the hard work while you kick back and relax. Then simply enjoy your chef inspired dish cooked to absolute perfection. De Dietrich ovens are a delicate balance of expertise and precision, a harmonious combination of premium materials (including a stunning copper bezel) and unique technological performance. Their ovens represent the skilful art of cooking to perfection, whether you are a professional chef or a cooking amateur. A perfect oven no matter what your culinary skill set. So, more than ideal for those of us who are average cooking joes. The stunning design sets De Dietrich apart from many of their competitors and quite frankly will look stunning in any modern kitchen. Available in four colour collections; Absolute Black, Iron Grey, Platinum and Pure White, you are sure to find your perfect De Dietrich match. Naturally, their range of cookers come with other matching appliances so you can go all out with the range in your kitchen! If you want to shop around for built-in cooking appliances, you’ll find a wide range of built-in single ovens, built-in double ovens, built-under double ovens, steam ovens and microwaves on our website. For more information on De Dietrich ovens or any of De Dietrich appliances, please don’t hesitate to give a member of our sales team a call. They are always happy to help 🙂 0115 965 1937.